Long time client Earl Trotter caught another big Bass, he has caught a lot of them with us through the years. The next day he caught 81 Shellcrackers to top off a great couple days of catching! Bass, Blue Gill and Shell Crackers are all on the menu for March and April if you just love to catcyh fish now is the time to visit us and enjoy the catching. Many days we will start with shiner fishing just to see if we can put our clients on a big trophy sized Okeechobee Bass and then once that slows down we move on to catching panfish. Whether it's big blue gill or shell crackers it doesn't matter, these fish fight like crazy and are very tasty table fare! Kids and adults alike will enjoy just plain old catching fish! Tom Howatt and his son Boyd enjoyed a special morning of catching big Bass on Lake Okeechobee, very large live wild shiners were the choice of bait and they were eating them! 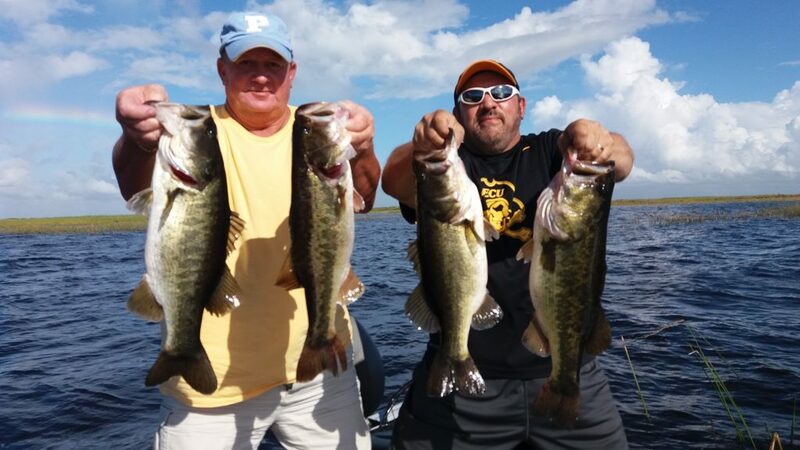 Lake Okeechobee is yielding great numbers of bass to anglers right now whether using live wild shiners or artificial baits. Wild shiners are responsible for more big Bass than any other bait on Lake Okeechobee, although right now top water plugs, spinner baits, senko's and 10 inch worms are all accounting for large numbers of small bass. Speckled Perch or Crappie as our Northern friends call them are being caught in the heavy cover areas of the marsh by anglers using small jigs, various colors will work, so search until you find a color they will eat. Anglers using minnows are finding good numbers of fish as well, the Kissimmee River or local canals all have a healthy population of specks so try your hand at fishing the Big "O" today. Give us call we are here to make your fishing day the best you have ever had!